Hotel Catalonia Plaza Cataluña, Barcelona. 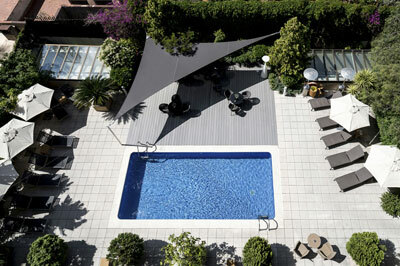 Catalonia Plaza Cataluña Hotel Barcelona. In the centre of Barcelona, very close to the Plaza Catalunya and the Las Ramblas exists a splendid hotel that offers a wide range of services and amenities in a wonderful contemporary setting. This fabulously restored building dates back to the year 1899, designed by the famous architect Emilio Salas y Cortés (master of Gaudí). The inside courtyard of this glorious hotel, guests will find a relaxing swimming pool with comfortable sun chairs, for a peaceful place to read and enjoy the sun. The hotel has a conference facility where it is possible to organise meetings, seminars or special events for up to 150 people. The seven rooms can be arranged as need depending on the size of the group or celebration. All the guests at the hotel are entitled to use of the spa in one of the other hotels, the Catalonia Ramblas, that is very close to the Hotel Catalonia Plaza Cataluña. Here guests will find spa professionals that offer a wide range of treatments and spa facilities for maximum relaxation and rejuvenation. Bicycle parking free for the guests of the hotel.